Police are still investigating a hit-and-run bicycle accident near Kenmore Square that killed an MIT professor this weekend. Kanako Miura, 36, a native from Japan and visiting professor at MIT since 2012, was struck and killed by a truck while riding her bike at the intersection of Beacon Street and Baystate Road around 3:30 p.m. on Sunday. The truck fled the scene. Police say they are looking for a garbage truck that was possibly involved in the accident. Bikes are considered a way of life in the city, but residents say that the area around Boston University is especially dangerous for anyone including cars and pedestrians, with accidents occurring at an average rate of two to three times per week. Since 2007, Mayor Thomas Menino has strove to make Boston a more bike-friendly city by implementing more infrastructures such as bike lanes and bike paths to support more cyclists as well as installing the Hubway bike share program. In 2011, Boston was rated one of the safest cities to ride in in the United States, and this year, Cambridge received a Gold-Level rating for being one of the most bicycle-friendly communities in the nation. Still, with more riders on the road today than ever before, the city is faced with the challenge of how to prevent more accidents from occurring. In a report published by the City of Boston in correspondence to Bike Safety Month, the Boston Police Department reported a bike ridership increase of 28% (56,000 trips per day) as well as a 2% increase in accidents (488 in 2012) since 2010. In more than half of the bike accidents reported, the cyclist was not wearing a helmet. •	The number of fatalities spiked in 2012, however both BPD and EMS show a minimal increase in total crash incidents between 2010 and 2012. During this same period, cycling trips increased (28%). •	Injured cyclists were less likely to be wearing a helmet than the average cyclists. About 43% of males and 60% of females involved in accidents were wearing helmets according to Boston EMS. 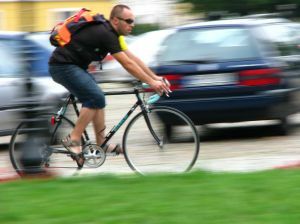 •	A majority of the cyclist crashes that resulted in injury involved motor vehicles (91%). •	Cyclist crash incidents involving and/or injuring pedestrians are minimal. Pedestrians comprised only 2-3% of incidents and injuries in all cyclist incidents. •	Key behavioral factors associated with crashes included cyclists not stopping at red lights or stop signs, cyclists riding into oncoming traffic, drivers not seeing the cyclists and drivers opening doors. •	Roads with the highest numbers of crashes also have high cycling volumes. The Kenmore/Fenway area had the highest amount of crashes reported, as well as Commonwealth Avenue, Huntington Avenue, Beacon Street, Boylston Street, and Dorchester Avenue. •	Young adults between 18 and 30 comprise more than half of all injured cyclists, and males accounted for about 76% respectively, of all bicyclists involved in accidents. •	The biggest peak time for crashes occurs around rush hour (5 p.m.) with smaller peaks between 7 a.m. and 12 p.m. The increased number of crashes at peak rush hour underscores the need for drivers and cyclists to share the road. In response to the report, Mayor Menino pledged to cut the amount of accidents in half by 2020. Some of the major changes that will be taking place are changes to infrastructure that support more cyclists and more targeted awareness, especially in universities, about preventing serious injuries by wearing helmets. Though Boston is one of the most bike-friendly cities in America, there are still many factors that pose dangers to cyclists every day. If you or someone you love was involved in a bicycle accident, give one of the experienced Boston injury lawyers at Altman & Altman a call for a free initial consultation. We have nearly 50 years of experience dealing with bicycle injury cases and we have successfully recovered damages such as medical bills, lost wages, pain and suffering and other costs related to bicycle injuries. Our attorneys are always available to answer any questions you have about your case.